We are still traveling with Jesus as He makes His way to Jerusalem for the last time, this side of the grave. The group is nearly there, but Jesus has one final requirement before He reaches the city. He has a prophecy to fulfill. Our story picks up at the Mount of Olives where Jesus sends two of His disciples out to bring Him a very specific donkey colt. Matthew has the disciples bring the mother and the colt, where Mark and Luke concentrate on just the colt. Mark and Luke also note that this colt has never been ridden by anyone. Jesus also had specific instructions as to what His disciples were to do and say once they found the colt. The first thing that strikes me in this story is that everything had to be prepared in advance for this day. Donkeys don’t just accept a rider right out of the gate. There is a lot of training necessary before even being led by a rope, let alone sat upon. Just out of curiosity I Googled how to train a donkey to ride. I found a Q&A forum that talked about the necessary steps. God had to prepare the owner’s heart. Not just anyone would be amenable to someone walking up and untying their donkey to take for someone else to ride. God also had to arrange for the specifically prepared colt to be waiting at exactly the right spot. Jesus told His disciples to “Go into the village in front of you and immediately you will find a donkey tied, and a colt with her” (verse 2). They were not sent to scout around for a donkey, but were told exactly where to find the exact donkey they were looking for. The preparation that went into getting this donkey, in and of itself, is a major miracle in my book. These events had to be accomplished to fulfill prophecy. That was preparation to the tenth power! God never leaves anything to chance. Jesus’ disciples didn’t even question Him when He told them to go take someone else’s property. They were given what to say if challenged and away they went. In Mark and Luke’s account we are told that they were challenged, but once they gave the reply Jesus gave to them, the challenge ended and they were free to bring the donkey to Jesus as requested. Like I stated before, God prepared the heart of the owner to release the donkey. Matthew had me a little confused as to which donkey Jesus rode into Jerusalem because he says that both were brought, both were covered with cloaks, and that Jesus “sat on them” (verse 7). After reading all three accounts, I think the “them” refers to the coats lying over the back of the colt. Being that Mark and Luke only mention the colt, I’m assuming they mean the young colt and not his mother. Jesus has been being followed by a large crowd. Everyone wanted to be near Him, and this trip was no exception. If anything, there were more people because of the annual pilgrimage for Passover was occurring. This crowd now turned into His personal heralding team. The donkey never touched ground once Jesus was seated on him. 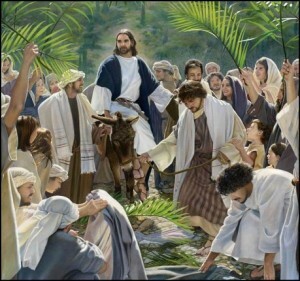 The people lined the path with their cloaks and palm branches. They shouted praises to Jesus and God throughout the whole procession. Jesus was encircled with praisers. This group could be heard for miles around. As the group approached Jerusalem, those already in town took notice and wanted to know what was going on. The praisers informed the curious that this was none other than Jesus from Nazareth. Not since King David had a King ridden in on a donkey. Solomon introduced the Israelites to the “noble horse” as the animal worthy of a king. Jesus’ wasn’t the conquering King. He was the servant King. He was humble; and so was His steed. Father God it amazes me to read all the little details You worked out to give us proof of Jesus’ Lordship. You left nothing to chance. You told us MANY years in advance just what was going to happen, then You MADE it happen. If those in power understood even half of what was happening, would things have been any different? You placed Jesus in the perfect time in history to ensure the arrogance and ignorance quotient was perfect for Your plans. Thank You for Your timing. Thank You that You know exactly how and when to make each move to ensure the outcome You have planned. I can’t even time watering my yard right! I want to say that I will leave the planning and implementing to You, but too often I find myself straining to try and make things go my way. I think I can handle it on my own and wind up making a mess. Thank You that You don’t yell at me when I mess up. Thank You that You are willing to help me clean it up, including often cleaning it up by Yourself. Thank You for letting me try again the next time instead of holding the reins out of my reach. Instead You carefully train me in the little things and remind me of Your presence and plan with the big stuff. Thanks for never giving up on me; Your stubborn little child.